The college’s textbook buyer has purchased thousands of course materials for the fall semester, and he’ll be on hand to help students find them. A custodian makes sure she has a hammer and a screwdriver in case a dorm’s residents need them. An associate dean practices the pronunciation of students’ names, and a librarian anticipates an inevitable question. Staff around campus are gearing up for the start of the academic year, excited to meet new students and, in their own way, enrich their experience on campus. See how seven of those staff members are getting ready, and how they hope to make connections with students. When students enter the Ladd Library, they can’t miss the reference desk in the middle of the first floor. Humanities librarian Christina Bell is one of the people behind that desk. 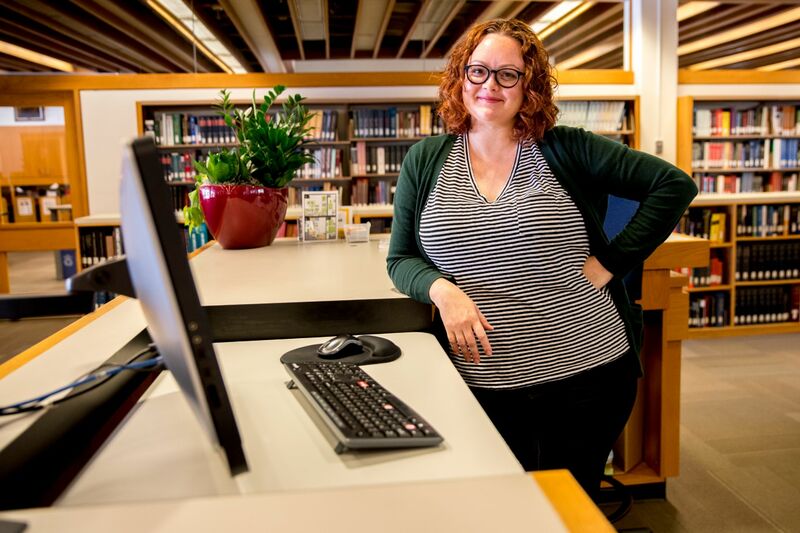 Her job is to help with any and all library-related questions, from finding course reserves to using a book scanner. Within the first two weeks of the semester, the most common question I answer is the location of the bathroom. A student comes up and says, “I have a stupid question.” I respond, “There’s no such thing.” When the bathroom location is where we start, nothing else is too “stupid.” That’s why I’m here, to answer the questions. I love my job. I like working with students and with faculty, and the level of interaction. I’m the face that they see. Even though there are dozens of other people that make this whole operation run, I’m the one they meet to make their work happen. That may be a research paper; that might be primary sources; that might be data. It can be any number of things. It’s citations — I know my MLA and my Chicago forward and backward. If you can’t remember how to write citations, it’s my job to know these things. Sometimes I have students who visit when they want to talk about the latest knitting pattern that they’re trying, because I knit, or they want to see pictures of my cat. We know each other as people, we see each other on campus. I go to events; I participate in things outside the library. That’s part of what it is to be a member of this community. Doug Morency joined Bates as director of security and campus safety in November 2017. For him, the start of the academic year is a great way to meet and welcome the students he and his team keep safe. This will be my first time on campus at the start of the academic year. My goal is go out into the community and be seen, be interactive, and to connect with as many students as I can, to let them know that they can always come to me and come to our security members, and to get through situations together as a community. When the first-years move in, usually Security provides just traffic control or points folks in the right direction. This year, we’re going to get some of our Security team members out there to be part of the volunteers. We’re going to be out in various locations holding doors, carrying boxes, having conversations and getting to know our new first-year Bobcats. Personally, I want to have conversations with the student body and to change the narrative of the perceived interactions between Security and student, to where we’re seen by them as a support mechanism and an approachable group. I think it will take both students and Security to keep on making efforts to get to know each other, hold each other accountable, while building in a communal way. We want to make sure that students understand that campus is not only a safe place to live their college experience, but it’s somewhere that they can be supported. 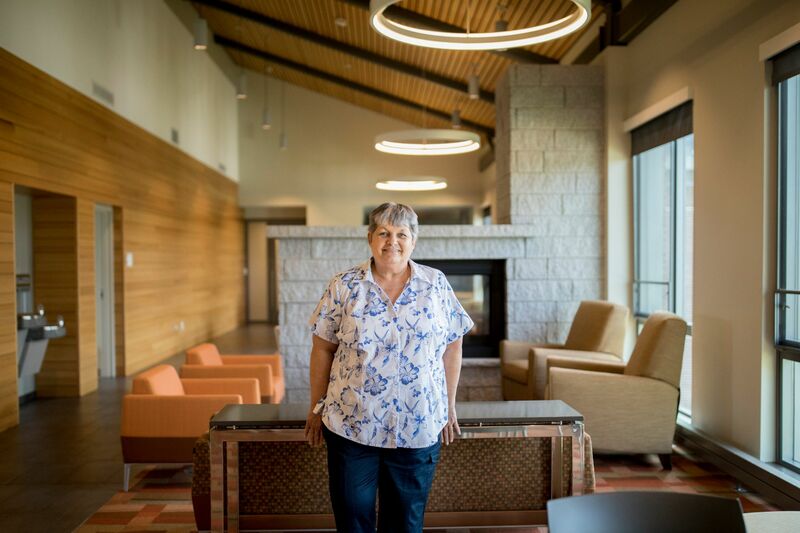 Each day in Kalperis Hall you’ll find custodian Rose Wilson, who takes care of students as much as she takes care of the building. It’s nice to see the first-years come in. They’re all excited, and some of them are a little nervous. Sometimes the parents even thank me for being so nice and kind. They put shelves together, so I always make sure I have screwdrivers and a hammer for that. Sometimes they just want to talk. I think they’re homesick. I always make sure the common areas and bathrooms are clean for them. I untie knots in their shoes if they can’t do it. I let them know that there’s an adult in the building, and if there’s anything that they need, they can let me know, and if I can help, I will. I hope they feel like they’re home; this is their home while they’re here. Whatever they do — within reason — is OK, because they live here. 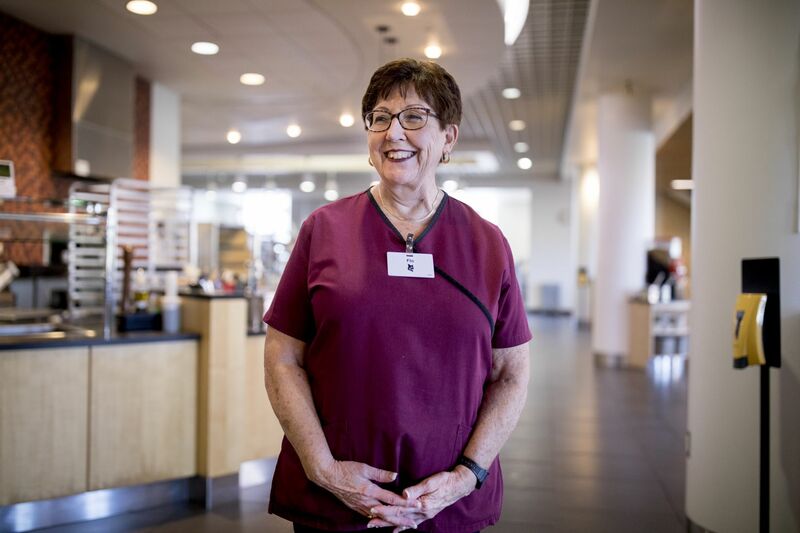 At Commons, dining room attendant Flo LaFlamme swipes students in, cleans, and stocks the dining hall’s different stations. Originally from Quebec, LaFlamme has worked in Commons for nearly 15 years, getting to know plenty of students along the way. I love the kids. I love their energy. It keeps me young. They’re fun to be around. I say good morning to all of them, and so that way I start conversations. I ask them how their day is going; they’ll tell me about their day, and ask about mine, and we go back and forth. I especially like the international kids. I’ve been there, so I understand it’s not easy changing countries. I didn’t speak the language. I got married, came to the U.S., and we had a little business, so that’s how I was forced to learn. I make it as easy as I can for the first-years, because they don’t know where everything is. I try to warm them up a little bit. There’s certain people that you get close to, because you communicate. You hate to see them leave after four years. 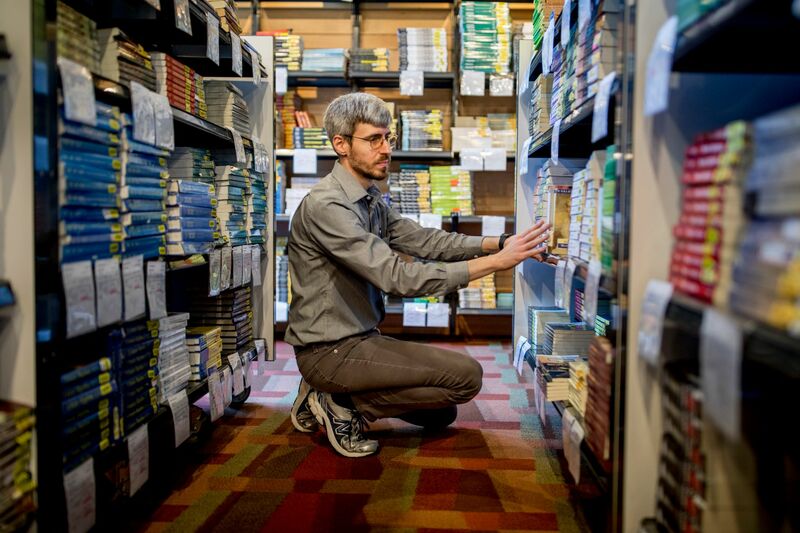 Zane Omohundro is the college’s textbook buyer — he works with faculty to make sure all the materials they assign students are in print, updated, and ordered. This year, he ordered about 8,500 textbooks and course materials for 360 class sections. As the semester starts, he’s on hand to make sure individual students can find the materials they need. When the first-years come in, this is really their first round, because in high school, you get your books and materials provided to some degree. Most of the time, nowadays they’re on their phones; they’ve got their course schedule, and I’ll approach them and say, “Hey, do you need help finding books?” Some of them say, “No, I just want to look around” or, “Sure, I’ll take your help.” We really try to engage everybody that walks into that area. We make sure students are getting their questions answered, help them find their books and things like lab manuals, or auxiliary things like goggles and access codes. We say, “Hey, if we don’t have it on the shelf for some reason, you have other resources, like the library course-reserves program.” We spend a lot of time saying, “Talk to your professor. If any of this is unclear, or you feel hesitant about buying this, make sure it’s what you need.” We’re a resource for textbooks, and we’re here to help if students need us. 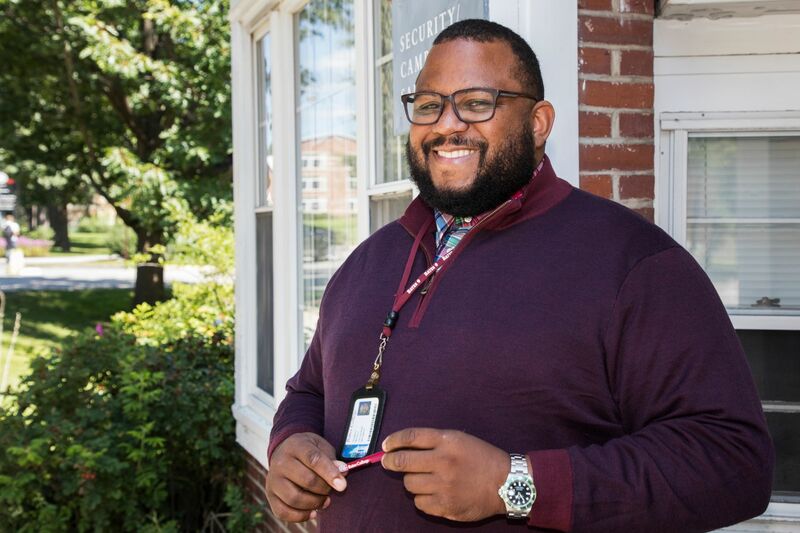 After many hours or days of travel, many international students’ entry into Lewiston and life at Bates is coordinated by James Reese, associate dean of students for international student programs. In August, I start studying International students’ names, to try to get as close to the correct pronunciation as I perceive it. I review where the students are from, looking to see if something is going on in their society or city that I might be able to chat about — they’re building a new bridge, or there’s some conversation about the economy or the local government. If I have tapped into something that is pertinent, that identifies that I’m more interested in them than just, here’s your room on campus and I hope you enjoy the food. This year, we have 53 first-years who are citizens of other countries and around 10 dual citizens. Of that number, we have about 20 planned pickups from the Portland airport or bus station. I coordinate all that, knowing that the families, naturally, are keenly interested. I often hear from them afterward. We’re not just picking them up; we’re greeting them and introducing them to the school, to Maine, to Lewiston. We want to make those little pieces easy so that they can recuperate from their travels, to be who they really are and resume their questions and interests about classes, meeting the professors, starting to know this place, getting some exercise, joining the clubs they’ve been thinking about all along. My goal is to have everyone feel comfortable, welcomed, and affirmed. 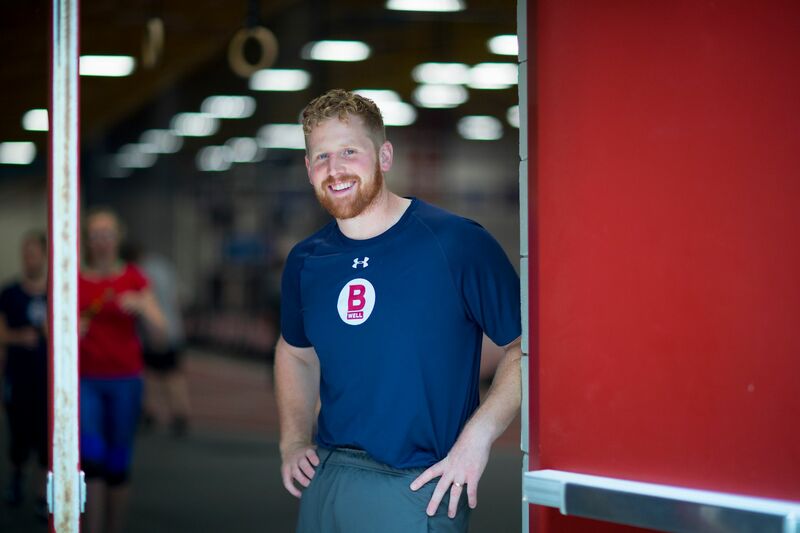 Mike Milliken wears many hats — he oversees club sports and the B-Well program for employees, teaches physical education, and coaches the club rugby team. 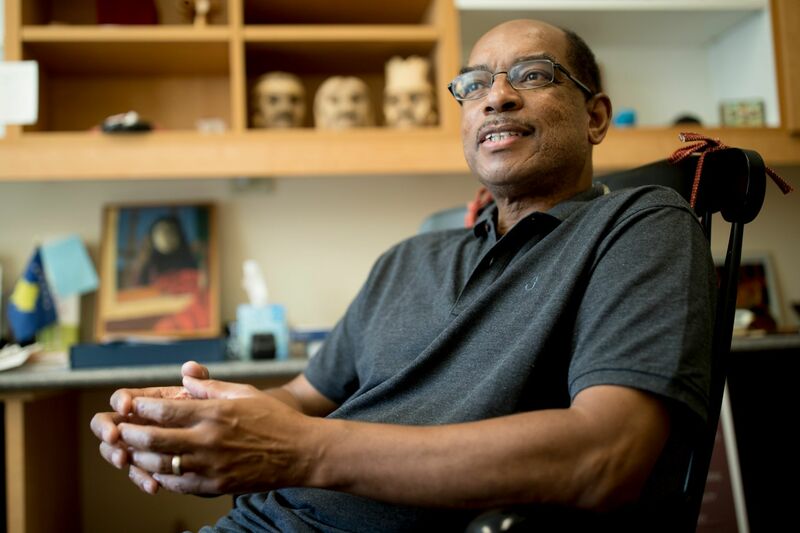 His overarching goal is to make sure the Bates community is healthy and happy. I’ll be involved with the club sports in the coming year, and I’m going into my sixth season as a rugby coach. I’ll also teach a physical education boot camp class for students this coming semester. Informally, I spend a great deal of my time kicking around Merrill Gym and Davis Fitness Center, so I’m seeing students in that capacity. I hope that I can be a positive influence from the wellness side. An underlying mission of mine is to spread positivity but also influence students to make healthy choices that improve their quality of life — and that’s not just students, that’s for the Bates community itself.